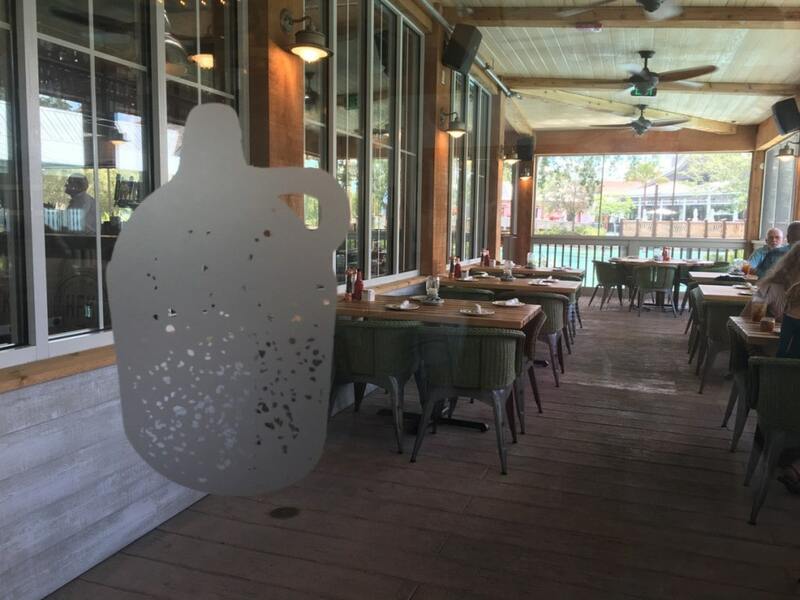 Frontera Cocina and Homecoming: Florida Kitchen and Southern Shine are two new restaurants that have now officially opened at Disney Springs. 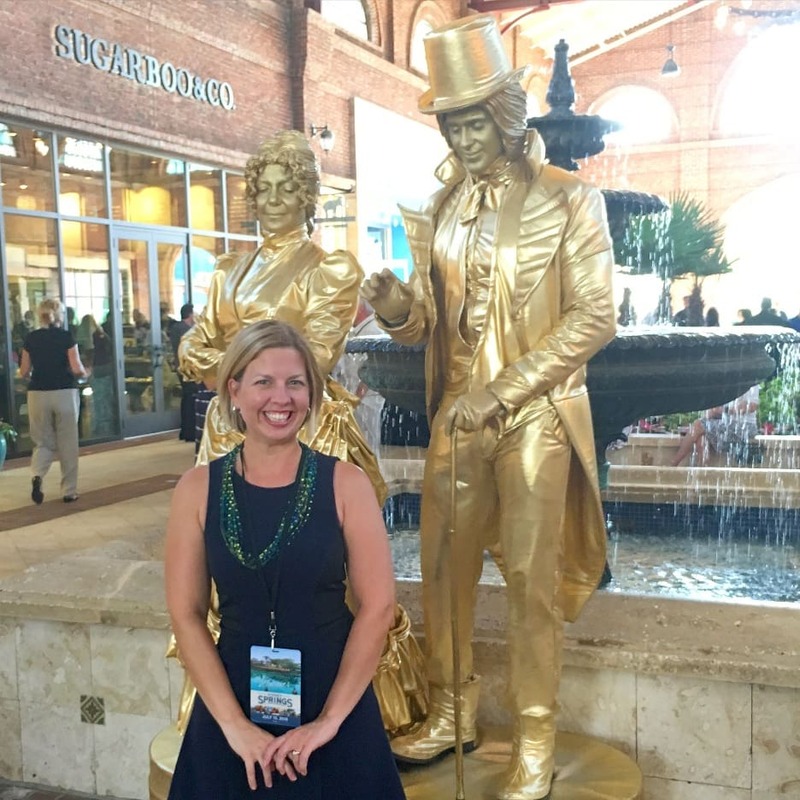 The dining, shopping and entertainment complex has debuted new offerings almost weekly (at least it seems that way!) since opening the first portion in May 2016. 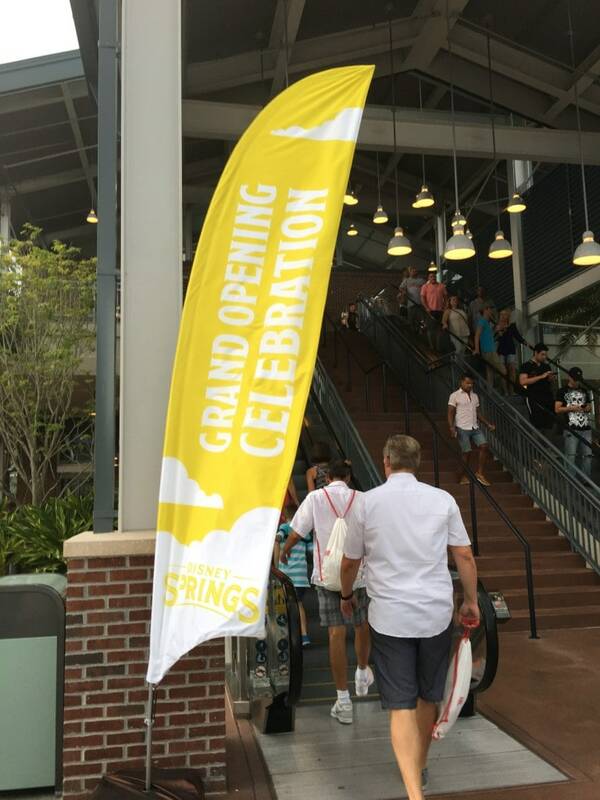 On July 15, Disney Springs launched its official Grand Opening Celebration, an event that will be celebrated until Labor Day. 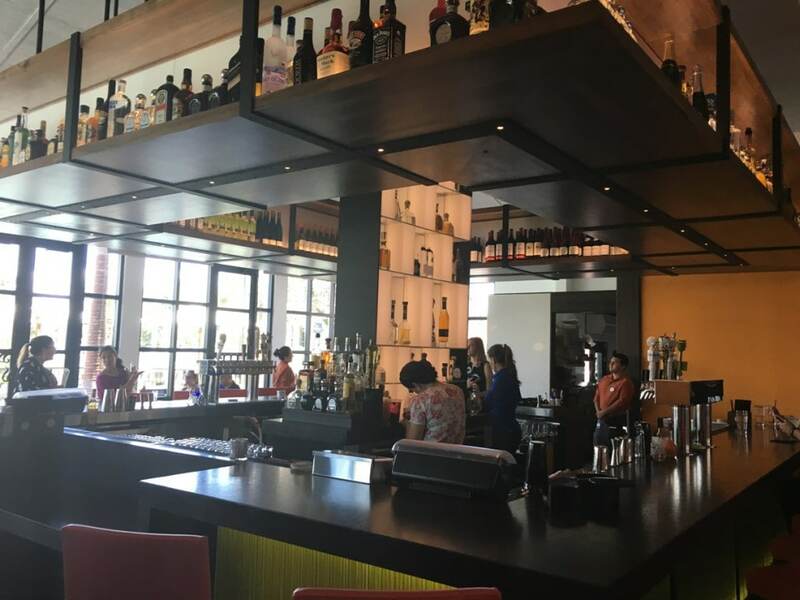 We were thrilled to get a sneak peak at the newest restaurants, and meet the celebrity chefs lending their notable culinary expertise to the latest great places to eat (and drink!) at Disney Springs. 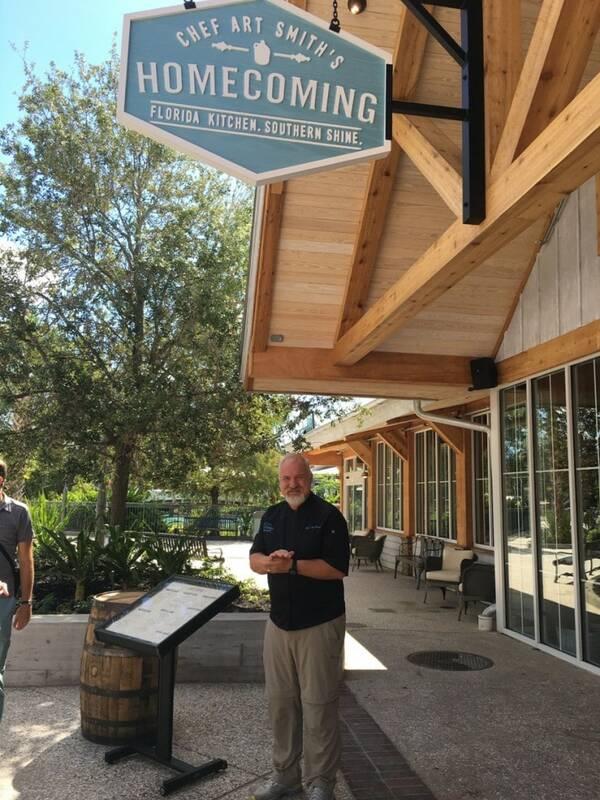 I had been anxiously awaiting the opening of Homecoming: Florida Kitchen and Southern Shine by Art Smith. 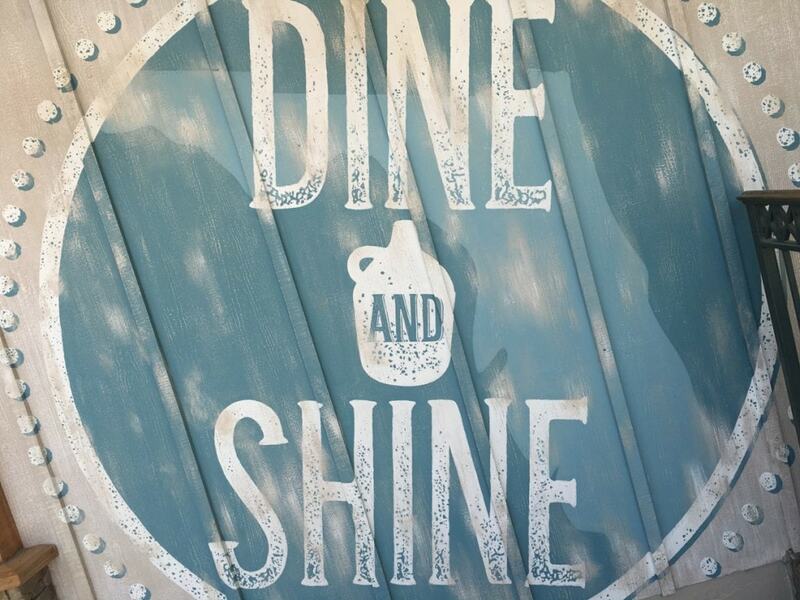 As a huge farm to table advocate – and unabashed moonshine lover – this restaurant has everything that makes me happy. More than 50% of the ingredients will always come from Florida. On any given day, the restaurant staff knows the percentage of local foods being used. On the day I dined at Homecoming, 81% of ingredients were locally produced. 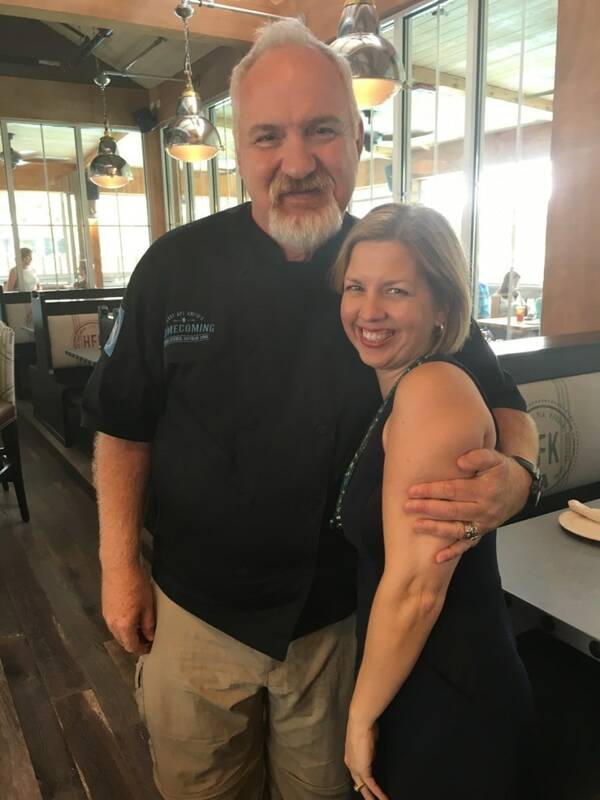 After meeting with Chef Art Smith, and having the privilege of talking with him at length about his passion for real food and food education for kids, his Homecoming restaurant now makes me even happier. Growing up in Florida and North Carolina, we know our Southern food. Some people claim to cook southern style dishes and miss the mark. He totally understands southern culture and cuisine, and infuses subtle references that true Southerners will understand. 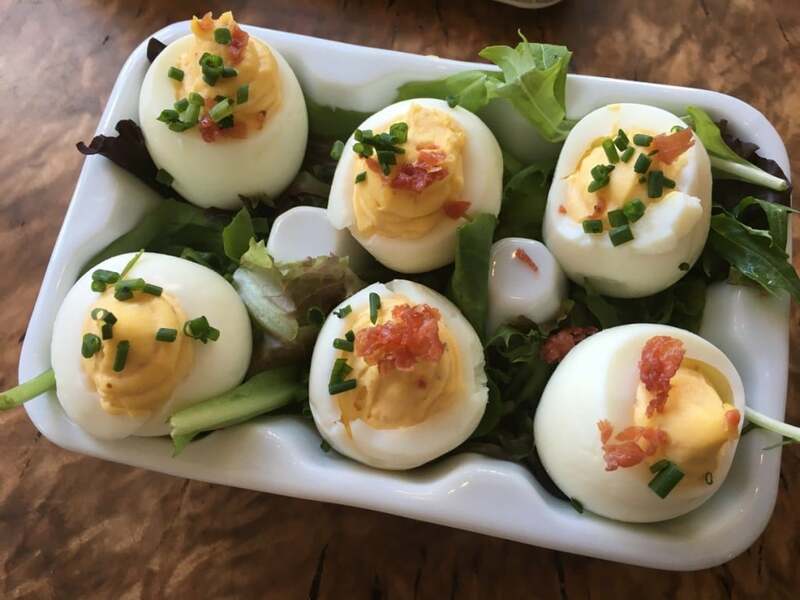 Like Church Lady Deviled Eggs, which are described as Homecoming-style whole deviled eggs. All great Southerners know that at any church Homecoming, there’s tons of food. And there are always deviled eggs. And there’s a slight competition on who can make the best ones, though no decent church-going woman will ever publicly admit it. 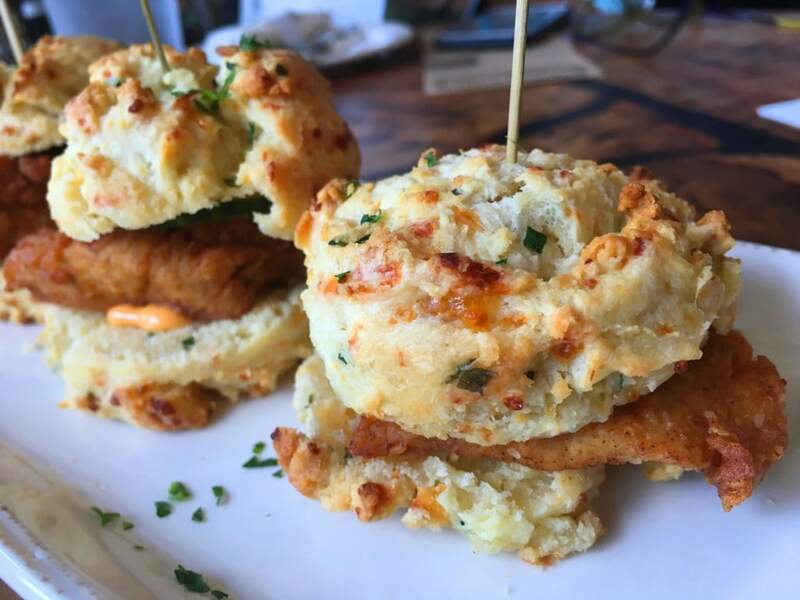 And you can’t do Southern food without fried chicken and biscuits. It would be sacrilege. So, of course, Art Smith’s fried chicken, which has been buttermilk-brined for 24 hours, is a masterpiece. 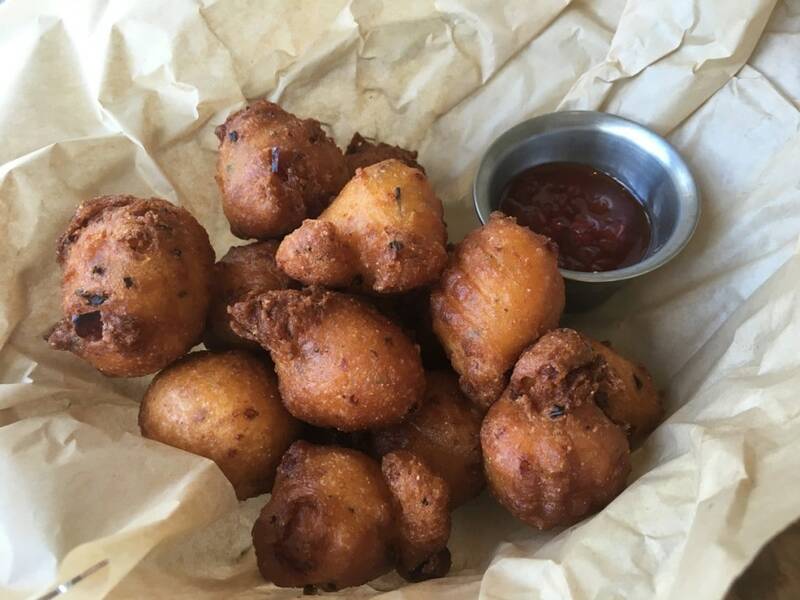 As are his “Bunch of Puppies” made with pimento cheese and served with red jalapeno jelly. If you don’t know what Hummingbird Cake is, then come to Homecoming for an education. This is how it’s done. 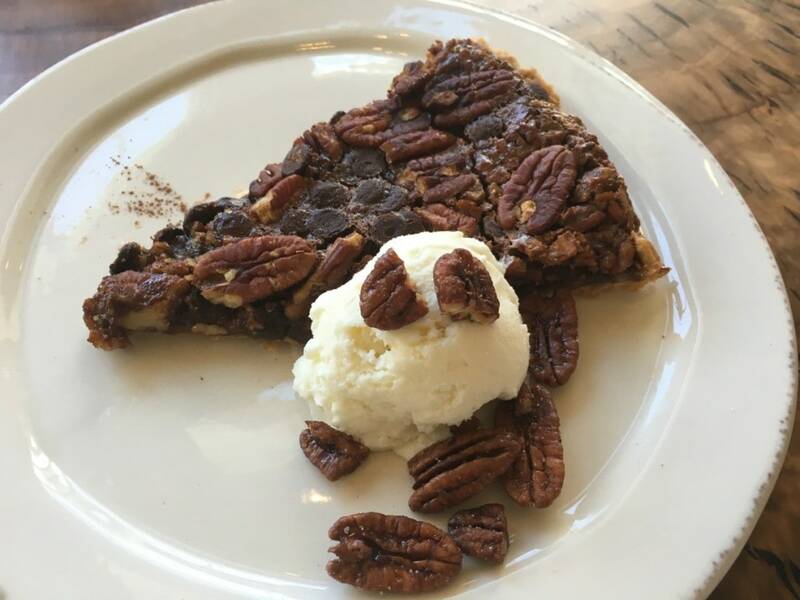 However, it’s going to be really hard to choose between Hummingbird Cake, Hamilton County Pecan Pie (a 100 year old Smith Family Farm recipe) and the Shine Cake, soaked with moonshine syrup. Yes, there is a MOONSHINE cake! And speaking of moonshine, there’s a lot of it at Homecoming. A LOT! It’s something that I love, and on top of the list of moonshines available at Homecoming is Troy and Sons. 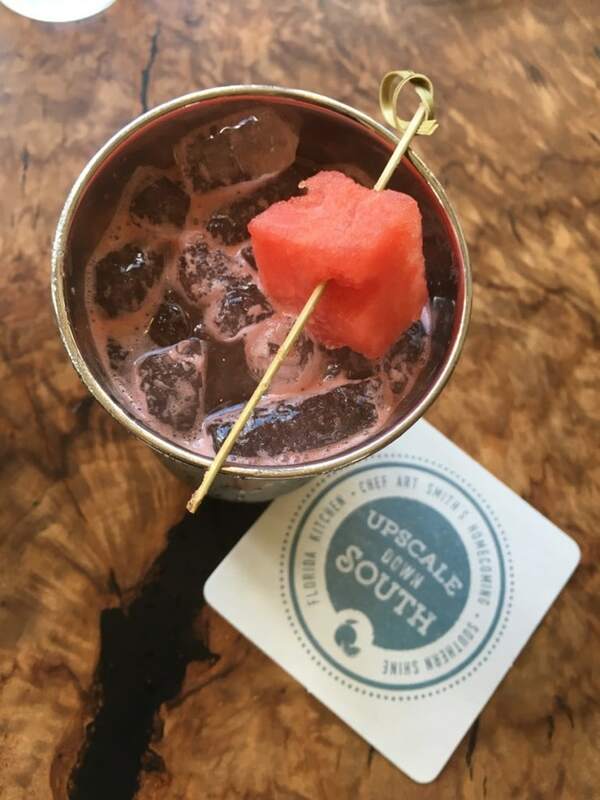 We’ve known Troy Ball for years, with her Asheville, NC distillery that makes some seriously fine and smooth moonshine. 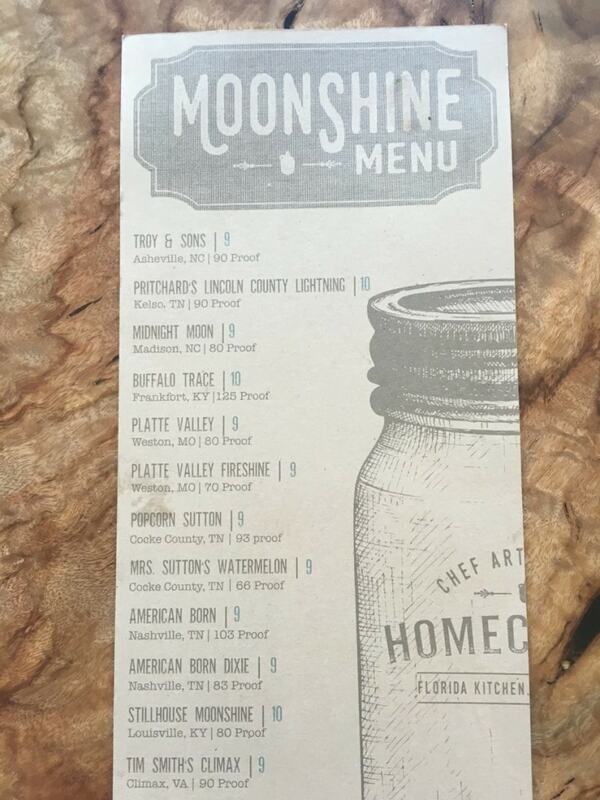 I love that there is a list of moonshines available, as well as moonshine cocktails and even distillery décor in the restaurant. Speaking of décor, look up at the chandeliers. They’re made from vintage burlap bags found in Florida. The murals are made by a local UCF grad artist. 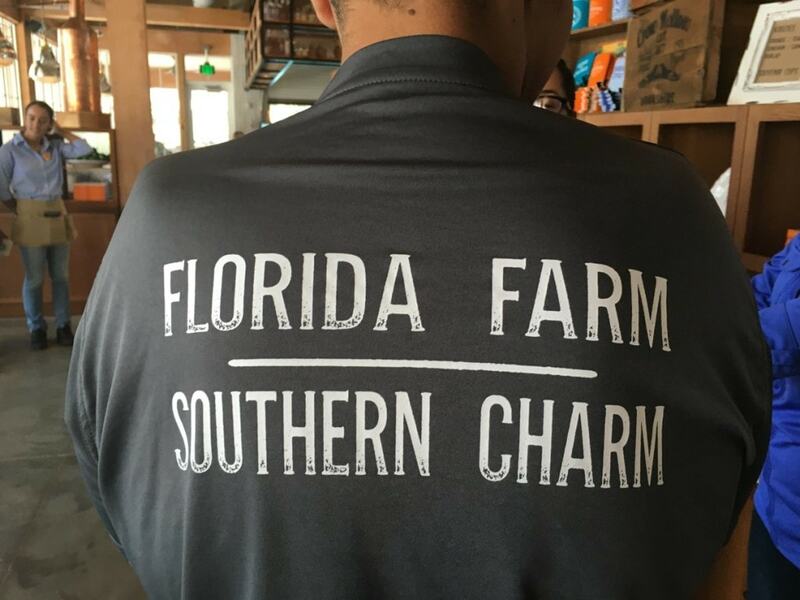 The farmers in the large photos are actual Florida farmers (such as Long and Scott farms). 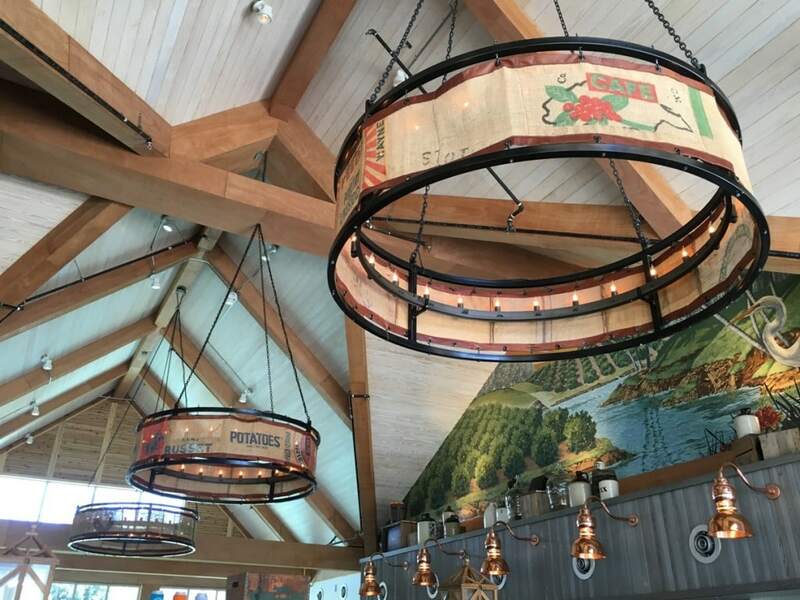 The wood is sourced from vintage cypress and old wood found in Florida, along with two large wooden tables made from wood found in an old moonshine factory. Yes, it’s all old Florida here. And it’s freshly done for a new generation. Smith desired to open Homecoming when he saw a rendering of Disney Springs five years ago. “I see Florida, but I don’t taste Florida,” he said. This is also the ONLY place that you’ll ever find a Homecoming restaurant from Smith. He states that he will never open another one. 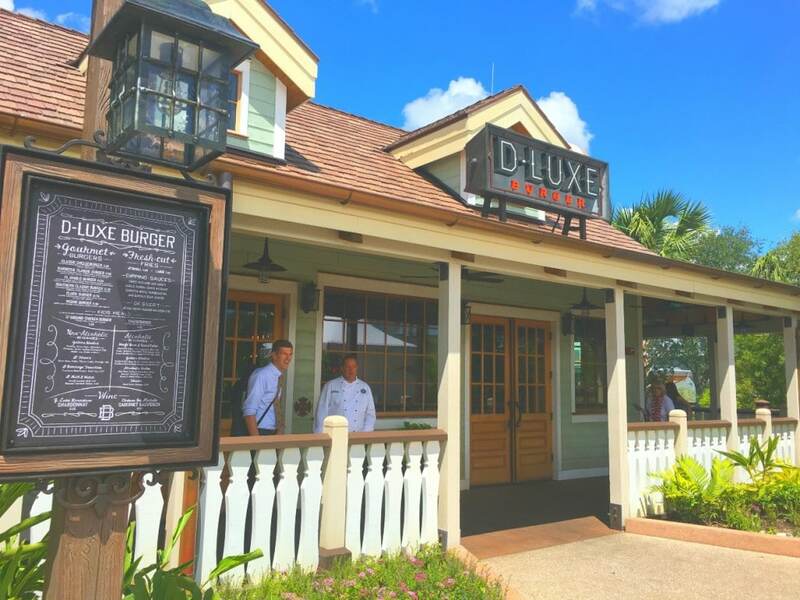 Straight from the Flavor Labs of Walt Disney World Resort, D-Luxe Burger is a quick casual restaurant serving up some seriously impressive burgers (even chicken and veggie) along with gourmet gelato shakes. 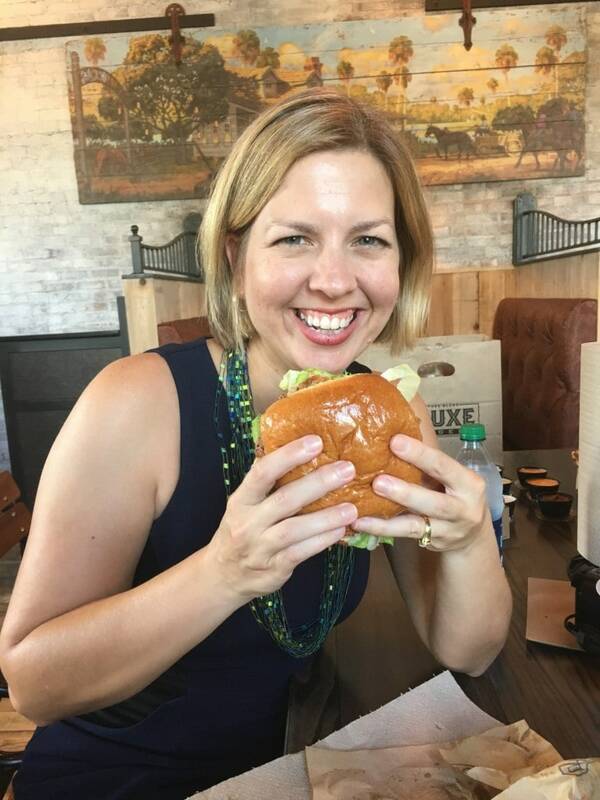 I tried the Chicken Burger, which was the best chicken burger that I’ve ever tasted. Topped with a house-made tzatziki sauce, it was rich and flavorful – and dense! These burgers are a handful and you won’t leave hungry. The 7 oz. 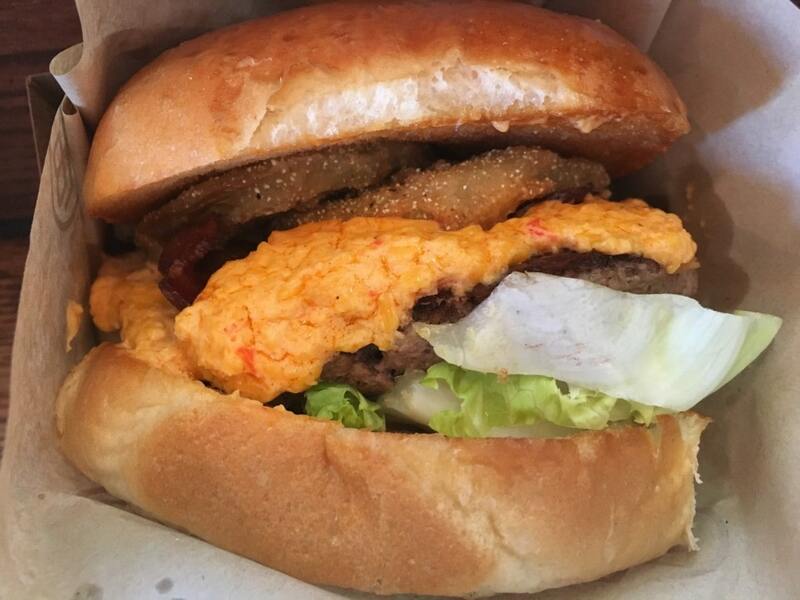 burgers are made simply, in house, and allow the flavor to really shine through. Buns come from Amorette’s Patisserie, the in-house bakery at Disney Springs. Sauces are made in house, as well. The fries come with a variety of dipping sauces. 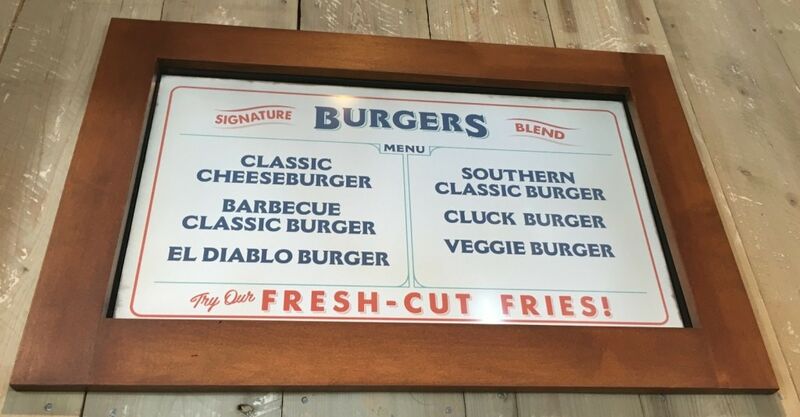 Choose one or several to dunk the fries in, but be sure to leave room for an artisanal gelato shake. 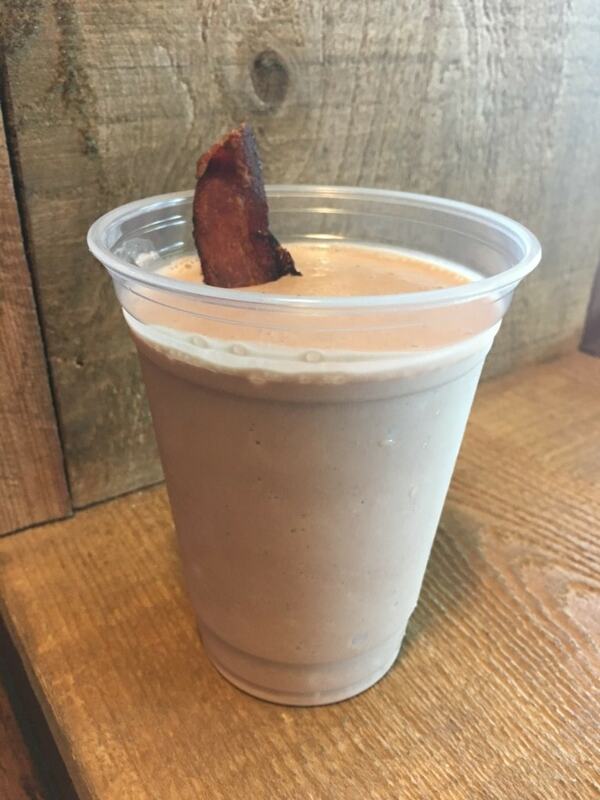 We chose an adult’s shake, spiked with bourbon and topped with bacon. It was a strong one, and it was worth it! 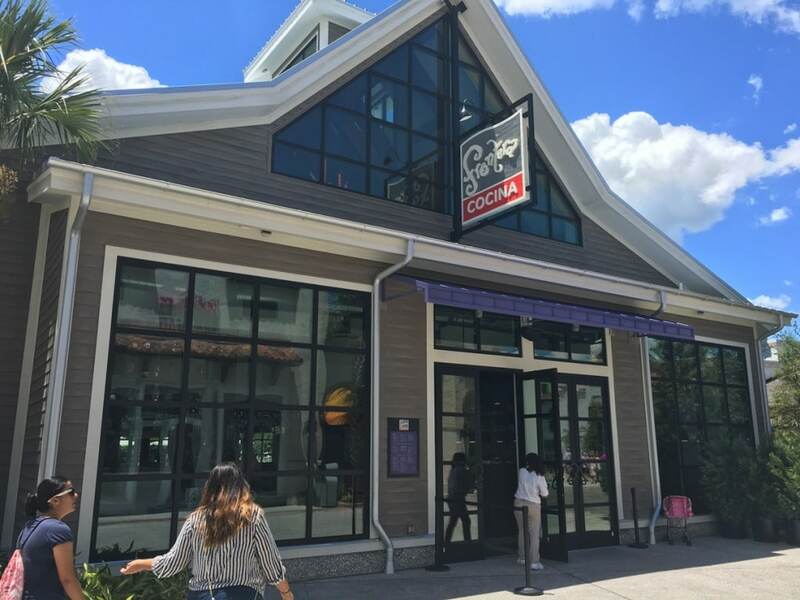 Rick Bayless has opened his latest restaurant at Disney Springs. Perhaps you are already familiar with Bayless, known for his PBS cooking shows. 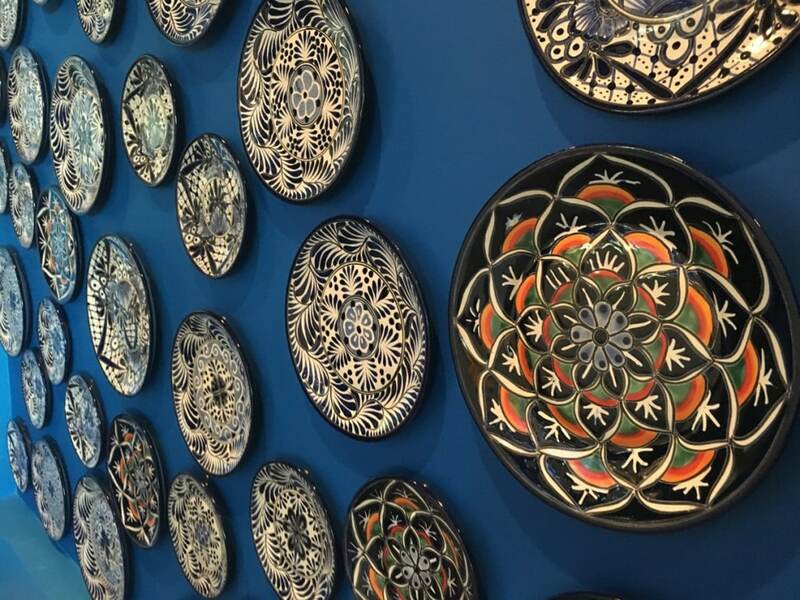 He is an evangelist for Mexican cuisine, and his passion is evident at Frontera Cocina. 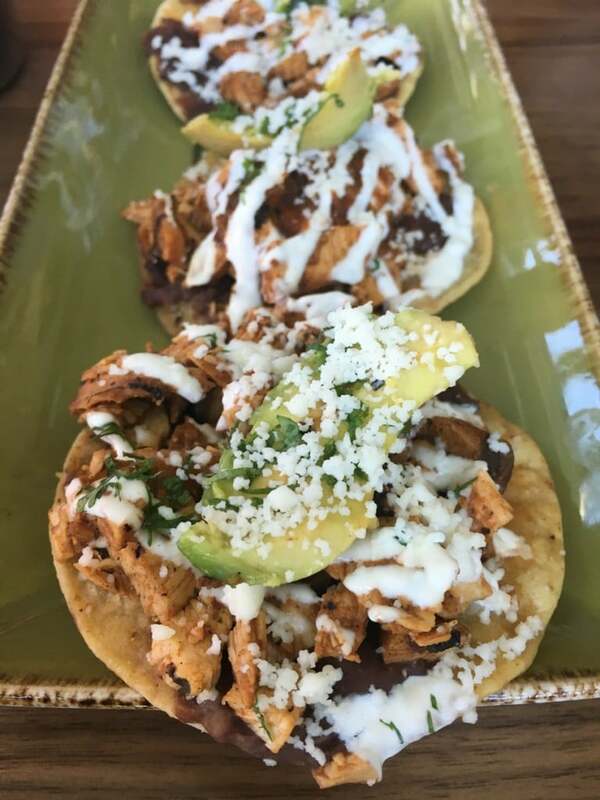 Among the must-tries on the Frontera Cocina menu are the Chipotle Chicken Tostadas, a delectable combination of chipotle chicken, black beans, queso fresco, avocado and crema. 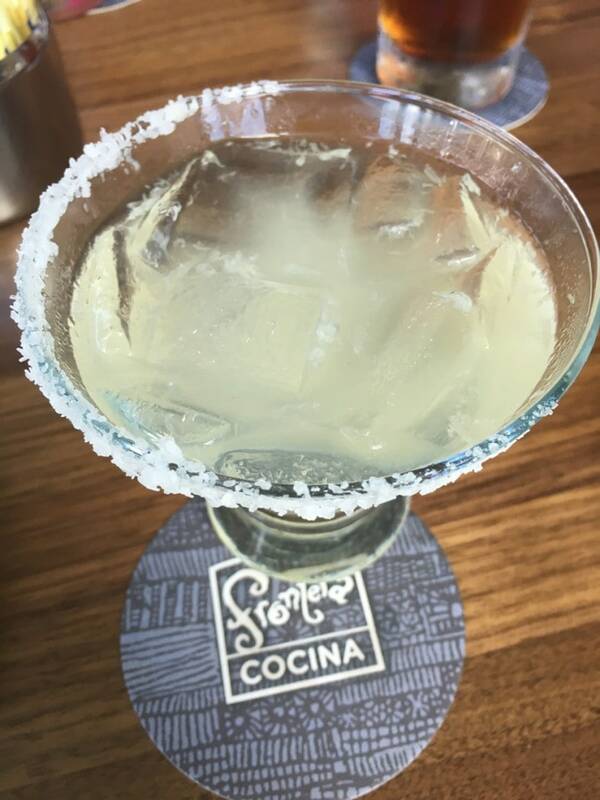 Of course, a classic Frontera margarita is a can’t-go-wrong choice. 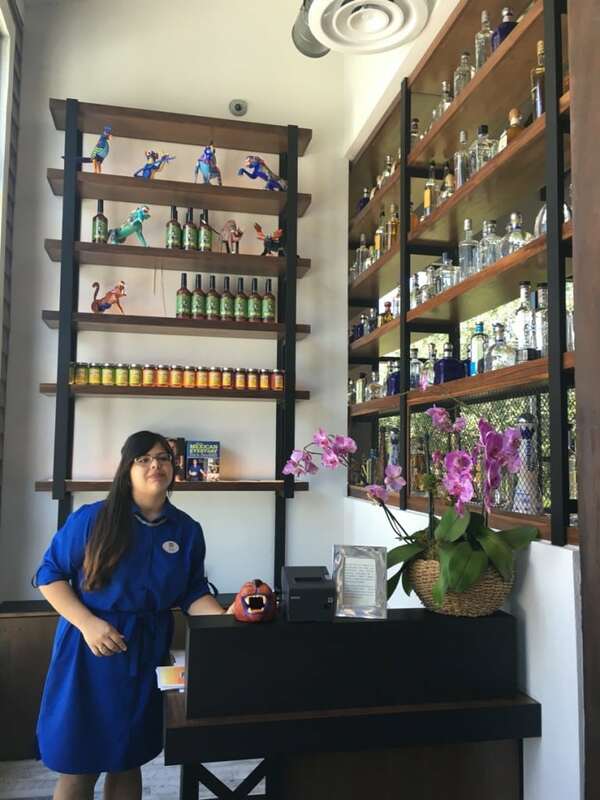 If you’re looking for one of the best places to sip and taste premium tequilas, Frontera Cocina is definitely a winner. 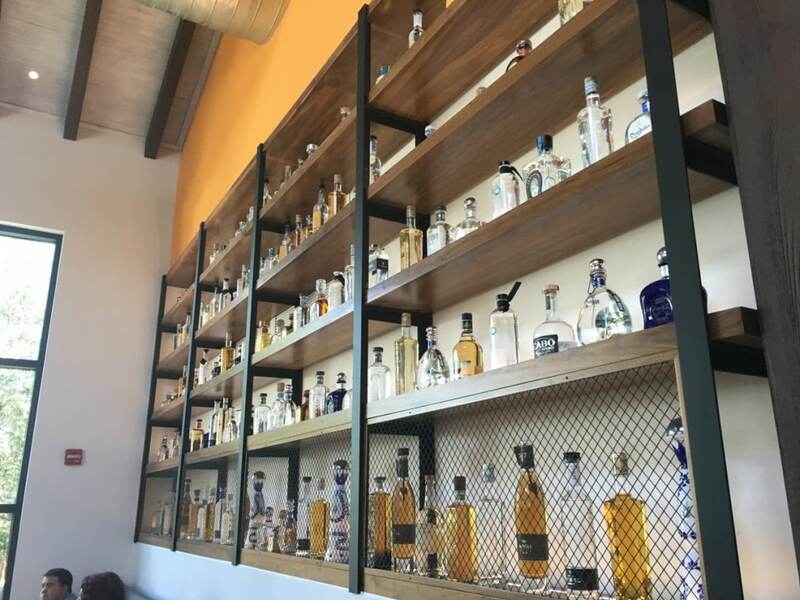 Agave flights are available, as is an extensive bar collection. 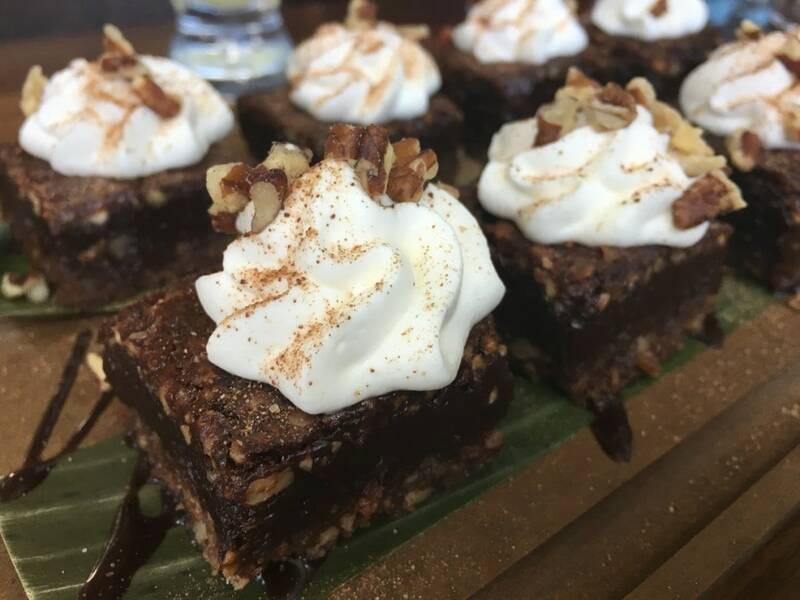 A bit out of the ordinary, but sinfully sweet, is the Pecan Pie Bar made with Mexican vanilla ice cream and a chocolate sauce. 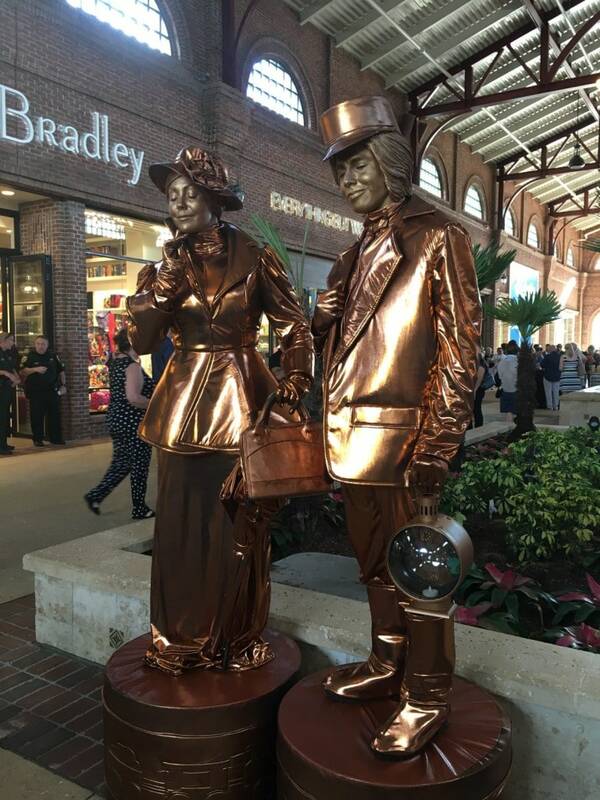 In addition to new restaurants, new entertainment can be found throughout Disney Springs, from musicians to street performers. 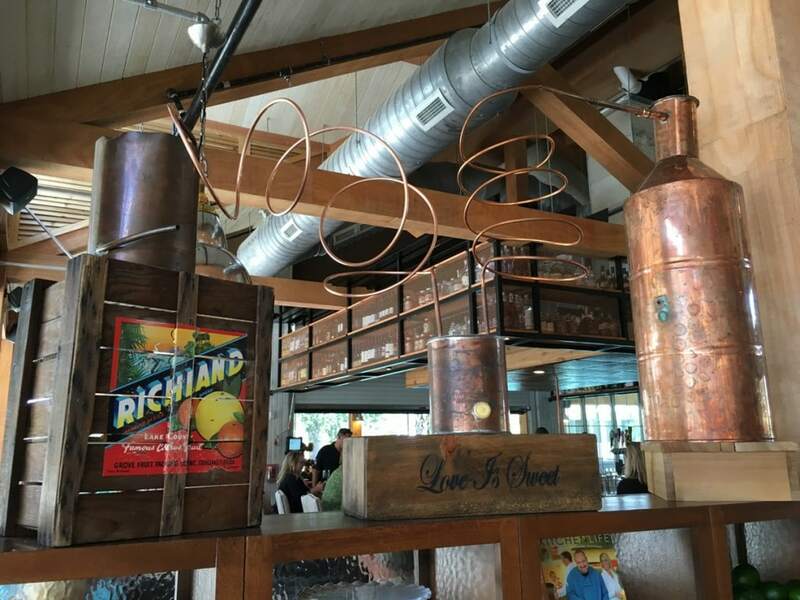 Have you been to Disney Springs yet? What’s your favorite place? 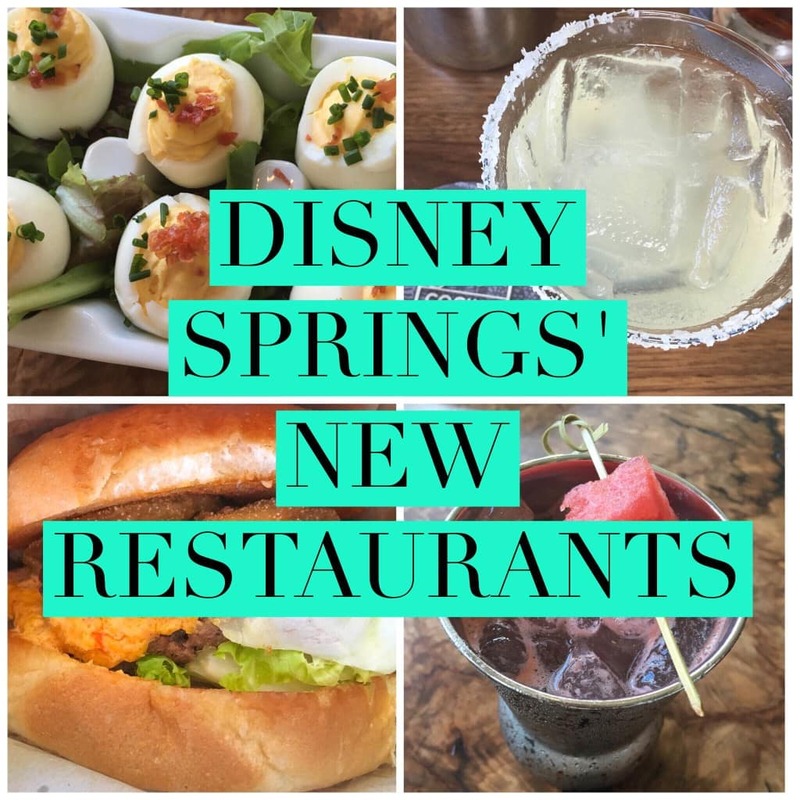 My husband and I were at Disney Springs on Friday night 7/22/16, we stopped by to check out The Homecoming Menu, we ended up going in for the deviled eggs, ended up having the hush puppies, a watermelon moonshine drink, hummingbirds cake, and the Chocolate cake! Our only negative to our evening was we had dinner at home. The whole experience was amazing!!! We love to hear that! Yes, we had all of those, too – except the Chocolate Cake! Now we’re jealous! Glad you enjoyed your meal. We are already making plans to go back!